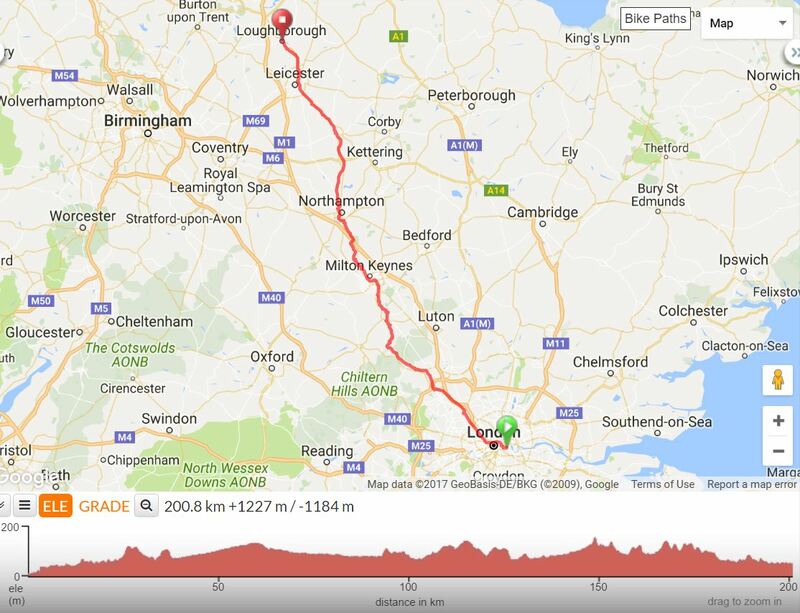 I’ve been planning my first big ride up to Nottingham for a work conference, which was mentioned in my Week 7 post. Luckily I’ve roped in a few fellow friends (thanks Alex and Kieron) to cycle with me one way, London to Nottingham. The whole journey is about a 480 km round trip, and that’s only if we don’t get lost. And to put it into perspective, this journey alone is the same as the total distance I’ve covered so far during my first 5 weeks Powered by Me. So after doing some planning for that trip, I started to feel better prepared and was figuring out if I was going to squeeze in some training or not. Then, another work trip comes up in Loughborough for 6 March. Sadly for me, this is the week before I need to be in Nottingham, which means I’ll be doing two big Powered by Me trips in about 10 days. Thankfully, my work colleague Amy is going to ride with me one way to Loughborough, thanks Amy! Advice? Tips? Just want to give morale support? I am not just saying this, I am terrified. I might be ‘sporty’ and ‘fit’ because I am doing this challenge, but I have never cycled these distances before. I haven’t had a rest day for 54 days, I feel knackered, dehydrated most days and a bit ‘on edge.’ Maybe I’ll just feel like this for all of 2017. Maybe I am still adjusting. Either way I would greatly appreciate any help, support, advice or guidance out there. I’ve jotted down a few things I think I need to get sorted before I set off for Milton Keynes (half way to Loughborough) on Saturday 4 March. For me, these are the things/stuff I think I must get done before I go. Learn how to wear cleats – I’ve had them since January and have been putting it off because I’m scared! Know how to change a tyre – right now, I know nothing! I already feel better after having written a list. But it’s not long before the rising panic starts again. Please please please share, comment and give any advice you are able to offer. Or perhaps you have a friend who rides a lot, or you know the best recovery tips. The more information I can consume the better. Ride with GPS has some sort of way that your friends and family can track your route, so nearer the time I’ll be posting information as to how you can follow these journeys. Wish me luck! Food – the right stuff! Food wise – il be taking flap jack, banana, cereal bars and a smoothie with peanut butter, yoghurt, milk and banana to have as soon as we finish. 2 water bottles – one for actual water and one for honey water as energy. Drink honey water every 20 mins and eat every hour. We will aim to stop every hour, for a couple of mins (to check the map, stretch the legs etc) and every 3 hours for a 20 minute break and an hour for lunch! I’m looking forward to it already!!! Amazing. We are all cheering for you and wishing you well. Just think how proud you will feel when you complete these two challenges! Keep us updated! Stay positive! I am biting my nails on your behalf!!!!! I have a head torch which you can borrow, and I am happy to drop it off before this Saturday? wish I could put a smiley face in but it’s a wonky one…I have a head torch on order so fear not!